Information technology (IT) contracts often involve complex business processes with risk to both the customer and the service or product provider. Legal practitioners, IT Managers and IT Service Providers require a thorough understanding of all aspects of contract law in this fast-changing legal landscape. Co-authored by leading IT legal practitioners and in-house counsel, Information Technology Contracts, a new title released in October 2018 by legal information and content provider LexisNexis® Legal & Professional, provides clear guidance on the key elements of negotiating specific contracts in the information technology industry. While IT contracts are governed by the same legislation and common law principles as any other contract, many of the components brought to market by stakeholders are intangible in nature, with unique user requirements and applications, necessitating the ever-increasing complexity and specialisation of information technology contracts. In Information Technology Contracts – the first South African title of this kind – the authors deal with the main types of information technology contracts, such as software development agreements, outsourcing agreements, managed services agreements, online or e-commerce contracts, cloud services agreements and maintenance and support agreements. Technological innovation, the constant need for businesses to renew, maintain or update existing technology and the continued rise in e-commerce requires that professionals in business, IT and legal remain abreast of developments. This practical resource for IT transactional legal work provides practice notes on different types of information technology transactions as well as the agreements and products encountered in such transactions. Information Technology Contracts is available in Print format ISBN 9780409126556 for R400.00 including VAT and excluding delivery. To purchase, visit the LexisNexis online bookstore at http://bit.ly/2ylzzNn. One Tech4Law reader/subscriber will receive a copy of Information Technology Contracts. 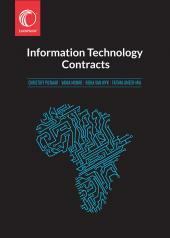 To stand a chance to win, name one of the authors of the new Information Technology Contracts title. Send your answer, name, daytime delivery address and contact number to thabile@logicocreative.co.za before the 30th November 2018.